Having turned heads for so many months during construction, The MARC, so named for its location on the Maude and Rivonia corner, is now fast becoming a thriving activity centre in South Africa's financial and business capital, Sandton. 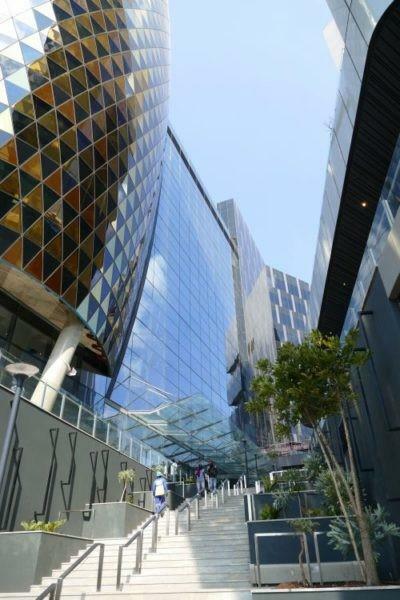 Developed by Eris Property Group, the former Village Walk was transformed into a mixed-use development that comprises two office towers, a two-level retail centre with everything from fashion to eateries, a gym and medical suites. And despite one of the office towers still being vacant, the precinct is already bustling with business people from surrounding office buildings, or professionals who work from any location at any time, hanging out there during lunch and after work, or breaking away for convenient informal meetings throughout the day. An important aspect that the architects from Boogertman + Partners got spot on, is to look beyond the building. After all, architectural design doesn't end where the building ends. In the case of The MARC, each building integrates well with the other elements in the mixed-use precinct, as well as with existing buildings in its vicinity. The entire precinct has an open feel to it with restaurants on the ground level opening up onto the street, creating visible activity and an inviting atmosphere. With multiple entrances from both Maude and Rivonia, and no barriers restricting entrance, the precinct is easily accessible from the street and surrounds, probably one of the biggest contributors to its success as a precinct. A wooden slatted ceiling speaks of indulgence and class. The MARC is favourably situated within minutes' walking distance from big office complexes such as the Johannesburg Stock Exchange (JSE), Deutsche Bank and Nedbank, as well as various major hotels such as the Protea Hotel by Marriot, the Radisson Blu Hotel, the Balaika Hotel, the Hilton and the Holiday Inn. And with never-ending traffic in Sandton, people don't really need much more of a reason to go on foot whenever possible. The walk as such is an interesting one, especially when approaching from Maude Street, where an African cultural market creates a vibe. The MARC is also well connected to public transport with access to a bus stop on the precinct's door step on Rivonia Road, metered taxis that operate in the area and while it is on the Gautrain bus route, it is a mere ten-minute walk to the Gautrain station. However, for those driving into Sandton for work, a seven-level basement provides safe parking. The MARC precinct opens up onto the street, making it easily accessible for pedestrians from the surrounding office buildings and hotels. As cities are growing, urban areas become more complex and effective space planning is required to ensure that services are optimised and that the amenities and facilities speak to people's preferences and needs. Therefore, in addition to walkable access to amenities, another key attribute of an effective precinct is the idea that people have access to healthy and active living, fresh food, and a sense of identity and community. At The MARC, a variety of shops and restaurants offer everything from fashion and specialty shops to beauty and from on-the-go, ready-cooked meals to coffee shops and fine dining experiences. Health and wellness is promoted by the 2 500m² high-tech Planet fitness gym, health shops, salons and a medical suite. A stunning skylight floods the two-level retail centre with natural light. From the outside, the spectacular triangular mosaic facade of The Jewel tower, together with the tall ENS Tower, makes a statement amongst the many other high risers in Sandton. The details of the interior, such as a variety of beautiful ceilings, clean lines and fine-detailed finishes, speak of world-class excellence, befitting the typical customer. In essence, The MARC brings Sandton a step closer to becoming an integrated, connected neighbourhood that encourages accessibility to a mix of uses on a human scale, providing environments where people can work, live, shop and play. To read more about how the facade of The Jewel was conceptualised and constructed, find "The MARC: Crafting the geometry of The Jewel facade" on www.buildinganddecor.co.za.